After an entire summer of staring at mountains I want to climb on 14ers.com my sprained ankle and foot were finally strong enough to give a 14er a go. Excited to see the progress of doing physical therapy this summer on my foot, ankle and knees, I was more than a little anxious to go hike. I figured I better pick an “easier” one and see how it went before jumping into any class 3 climbs. Grays was top on the list. That was until I woke up Sunday to find that the road up to Grays and Torreys was washed out (even more so than usual) and most cars and SUVs were unable to drive up it. This changed the plans. Andrew had to work until 6:30 Monday morning, so I needed to find a hike that was close enough he could meet up with us and was still not too difficult. A part of me also wanted to hike one I hadn’t done before. I choose Mt. Elbert which happens to be the highest peak in Colorado. Monday, Labor Day, I rounded up my friend Melissa, my two new room mates (that had just arrived in town three days before), and our friend Rob to hike Mt. Elbert. We left Golden at 4 a.m. and got to the trail head of the Northeast ridge around 6. I had no expectations of reaching the summit with so many people and myself who had not done any hiking all summer. The trail starts below tree line, so the first couple hours we ascended up with nothing but evergreens surrounding us. At tree line we all felt good, no signs of altitude sickness and my foot was doing better than expected, so we went on. You can see what looks like the summit when you reach tree line but Andrew had warned me about a few false summits so I knew better than to think we were that close. Slowly, we made our way up the first false summit towards the next one when Andrew, who started a good one or two hours after us, caught up. He passed 42 people going up the trail. Even with what I considered almost a “late” start, we had started earlier than a majority of the people hiking up Elbert. The class 1 hike on a well made trail turns into a steep scree field near the first false summit. I had no issues, but I was glad to have trekking poles for the way down. After the second false summit you can finally see the real summit and from there I knew we were all going to make it. As usual, seeing the top gave me a second wind and I had no issues the rest of the way up. At the top, a crowd of people stood around, taking photos, talking on their cell phones and eating lunch. It was cold and windy and with an even larger crowd coming towards the already busy summit from both the Northeast and East ridge we were all ready to start the descent after about ten mins. Leaving Leadville we decided to take 285 home to avoid I-70 traffic. Four hours of being stuck in holiday traffic later, we made it home. 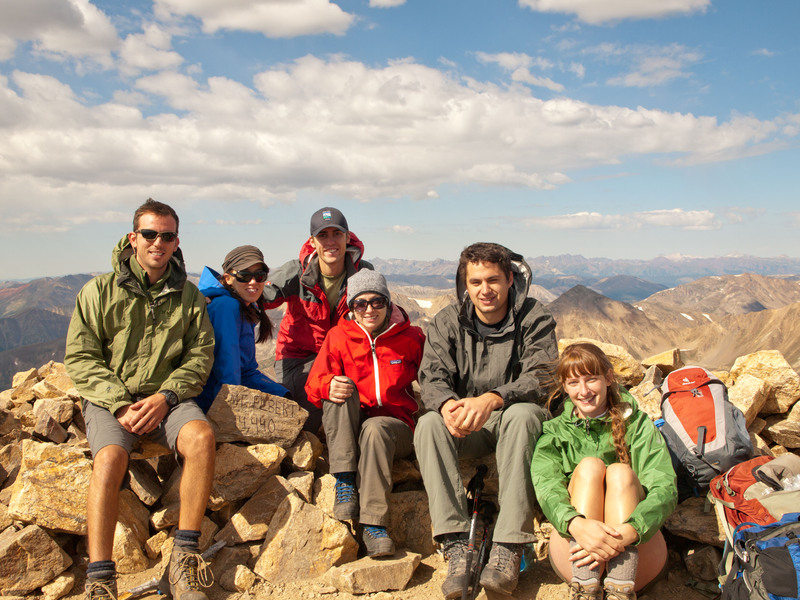 9 miles hiked, 4,700′ of elevation gained, and the highest peak in Colorado. If you ask me, it was the perfect day. Nice, Whitney! Elbert was my first 14er experience, too! I remember I was surprised to see someone smoking a cigarette on the summit, and then another person smoking a joint. Definitely a stout day! Thanks Brendan, not my first 14er, just my first 14er this season. 🙂 Cigarettes on a summit!? That’s just what I want to smell when I’m outside in the mountains, especially at 14,000′. That’s a ton of elevation gain! Sounds like an awesome hike. I did Grays & Torrey’s and got caught in a lightning/hail/thunderstorm on the way down. I would definitely recommend doing anything possible to avoid that! We definitely didn’t leave early enough. Yikes, scary! I’ve always been afraid of that happening! Whoohoo! Good for you. Maybe next summer when my ankle is healed I can climb a14er too. I enjoyed reading about your Mt. Elbert experience. I am 62, have walked a few half-marathons (hip replacement means running is now allowed), and my husband and I gave Mt. Elbert a try on Monday, 9/1/2014. We live in Leadville, so altitude wasn’t as much of a problem as it might have been (although I did my share of huffing and puffing). My husband summited, but close to the false summit, I got scared by the slippery scree. I had twisted my ankle a week before and thought, “not this time,” unfortunately. I had not considered poles, but am thinking now that they might help improve my balance and be kinder on my knees downhill. I will try again!